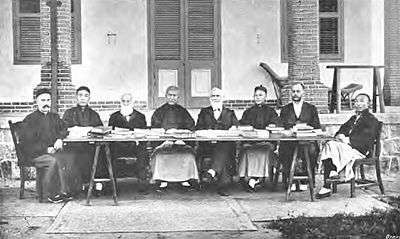 The Chinese Union Version (CUV) (Chinese: 和合本; pinyin: héhéběn; Wade–Giles: ho2-ho2-pen3; literally: "harmonized/united version") is the predominant translation of the Bible into Chinese used by Chinese Protestants, first published in 1919. The text is now in the public domain. The CUV is currently available in both traditional and simplified Chinese, and is published in Hong Kong by the Hong Kong Bible Society, a Bible society affiliated with the United Bible Societies; in Taiwan by the Bible Society in Taiwan, also associated with the United Bible Societies; and in China by Amity Printing Co., Ltd., of the Amity Foundation in Nanjing, related to the China Christian Council and also affiliated with the United Bible Societies. A revision for the CUV, the Revised Chinese Union Version (RCUV) (Chinese: 和合本修訂版; pinyin: héhéběn xiūdìngbǎn; Wade–Giles: ho2-ho2-pen3 hsiu1-ting4-pan3), was completed for the New Testament in 2006, and for the entire Bible in 2010. The CUV was translated by a panel with members from many different Protestant denominations, using the English Revised Version as a basis and original manuscripts for crosschecking. Work on the CUV began in 1890 and originally, three versions of the CUV were planned—two classical Chinese versions and a vernacular Mandarin Chinese version. The CUV was completed in 1919, with one amalgamated classical Chinese translation and one vernacular Mandarin translation. With the onset of May Fourth Movement, and the associated New Culture Movement, the CUV is the second translated work to be published in Vernacular Mandarin Chinese, after the first vernacular Chinese Bible, the Peking Committee Bible. The CUV in use today is the vernacular Mandarin Chinese version, published in two slightly different editions—the Shen Edition (神版) and the Shangti Edition (上帝版)--differing in the way the word “God” is translated. The vernacular Chinese language in the CUV has changed a lot since 1919 and its language is stilted for modern readers. Furthermore, many Chinese characters used in the CUV have fallen into disuse and cannot be found in commonly available dictionaries today. Work towards the revision for the CUV, the Revised Chinese Union Version (RCUV), started in the early 1980s. Its goal was to update the language of the CUV while keeping as much of the original translation as intact as possible, ultimately resulting in an update of 15% of the New Testament and 20% of the Old Testament. The revision to the New Testament was completed in 2006 (新约全书─和合本修订版), and to the entire Bible in 2010. This version was consecrated on 27 September 2010 at St. John’s Cathedral in Hong Kong. Text in the Chinese Union Version is typeset generally vertically from right to left, with some captions for illustrations typeset horizontally from left to right. The typography is unusual, with many archaisms and some ad hoc typographic devices. The CUV employs old-style punctuation, setting most punctuation marks as if they were ruby. It uses the standard proper name mark only for personal names, but an ad hoc punctuation mark that can be described as a “double proper name mark” is used for geographical names; both of these are typeset on the right-hand side, instead of the currently standard left. The book title mark is not used, and book titles are not marked in the CUV in any way. Chapter and section headings are typeset in sans serif type. Verse numbers are typeset on the right-hand side of the first word of each verse as ruby. They are also repeated in the margins. New paragraphs start after chapter and section headings. Within each section, however, paragraph breaks are indicated by the traditional Chinese pilcrow, a thin, sans-serif circle about the size of a Chinese character. In the Shen Edition of the CUV, a full-width space is added before each word “God” so that the paging between the Shen and Shangti editions are identical; this extra space is interpreted as the traditional honorific marker. Comments and notes are typeset as warichu. Additionally, an ad hoc punctuation mark that looks like a dashed underline is used to mark editorially inserted words; like the two varieties of the proper name mark, this mark is also typeset on the right-hand side. Typesetting the proper name mark on the right would have caused clashes with verse numbers and most punctuation marks. However, when clashes occur, the proper name and similar punctuation marks that cause the clash are partially truncated to avoid omitting any punctuation marks. Because of the old-style and ad hoc punctuation, the CUV looks archaic and somewhat strange to the modern reader. The result of updating the CUV’s punctuation in line with modern usage is the Chinese Union Version with New Punctuation (CUVNP or CUNP; simplified Chinese: 新标点和合本; traditional Chinese: 新標點和合本; pinyin: xīnbiāodiǎn héhéběn; Wade–Giles: hsin1-piao1-tien3 ho2-ho2-pen3) which was published in 1988. This edition with the Chinese characters written horizontally, printed by Amity Printing Company, Nanjing, and published by China Christian Council, Shanghai, constitutes the largest number of the Bibles in present-day China. Some wording and proper nouns (people's names and place names) have been changed from the 1919 version in order to adapt to the modern use of the Chinese language. A bilingual Chinese-English edition, the Chinese Union Version combined with the New Revised Standard Version, is also published by China Christian Council. The CUV is available online, due to its public domain status. The text in the online versions, however, is slightly different because Big5 does not contain all the characters needed to typeset the CUV. ↑ Zetzsche, Jost (1999). "The Work of Lifetimes: Why the Union Version Took Nearly Three Decades to Complete". The Bible in Modern China: The Literary and Intellectual Impact. Institut Monumenta Serica. ↑ Wong, Katie (Oct 27, 2010). "Revised Chinese Union Version (RCUV) Century Bible Released". The Gospel Herald. Bible Moments (圣经时光） - a mobile application (iOS/ Android) containing CUV, RCUV and ESV Bible versions developed for the Chinese market.